Papers from our our very successful and well received Edinburgh Conference, held on Friday 26 September 2014, are now available as a free download on our website. Edited as usual by Barbara Simms and Cris Ratti, they are presented as a ‘virtual’ issue of Garden History 43: supplement 1, Spring 2015. 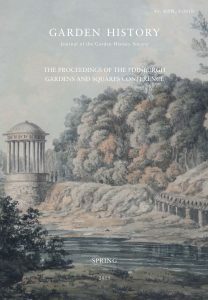 The cover of this issue shows: The newly constructed St Bernard’s Well from the west, shown in a watercolour (c.1790) by Hugh William ‘Grecian’ Williams. Courtesy: private collection. Nearly all the papers presented at the Conference are included, listed below, and can be downloaded, in pdf editions, by clicking on the appropriate article title. Who lived in the New Town and how were their gardens Used? Rethinking Green Spaces: what’s happening to our Public Parks? International Practice: what’s everyone else doing?